Ed note: As parents, we spend a lot of time keeping our kids safe. That means holding hands while we cross the street, buckling them into car seats and many other things. But have you considered your child’s financial safety? Here’s what you need to do to stay on top of threats to their future financial wellness. Many people don’t realize that children are over 50 times more likely to become victims of fraud and identity theft than adults. It doesn’t matter if they’re still in diapers or are old enough to ask for the car keys. It turns out that kids have something thieves want: clean credit reports. Plus, children don’t check their credit reports the way adults do, so identity-stealing criminals may not get caught for decades. You might wonder who would prey on your child’s identity. Unfortunately, criminals can be closer than you think. They could include a family member, neighbor or a worker who enters your home. Or it may even be someone you’ve never met. Once a thief has your child’s personal information they might use it to get loans, government benefits, medical care or to file bogus tax returns for illegitimate refunds. While it can be devastating to have your identity stolen as an adult, getting it resolved for a child can be even more difficult and time-consuming. That’s because most parents and victims don’t find out about the theft until years later, when the child tries to get a driver’s license, mobile phone, loan, apartment, job or student financial aid. By then, your child could have mountains of debt in his or her name, a botched credit report or even a criminal record that no one has a clue about. You receive pre-approved credit card or insurance offers in your child’s name. You receive calls from collection agencies asking for your child. Someone in your family is denied government benefits because they’re being paid to another account. You receive a notice from the IRS that information on your tax return is listed on another tax return. A government agency asks you to confirm that your child is employed, even if he or she has never had a job. You receive a notice from the IRS that says your child failed to pay income taxes, even if he or she has no income. Anytime you find something suspicious, immediately contact the three nationwide credit bureaus: Experian, Equifax and TransUnion. If creditors are involved (such as a lender or credit card company), notify them and file a formal police report. Keep detailed records of who you speak to and what you discuss, just in case you need to take legal action. 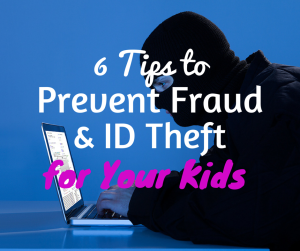 Though you can’t completely protect children from identity theft, here are six tips to help prevent fraud and keep them safe. They say one man’s trash is another man’s treasure. To make sure an identity thief never gets your child’s information, make confetti out of all documents with personal information before throwing them out. Keep all documents with personal information—such as a child’s Social Security number, birth certificate and passport—in a fire-proof safe or a bank safe deposit box. Remember to never carry your child’s Social Security card in your wallet. Stolen documents are a common way that thieves get information they need to assume a child’s identity. When a company or institution asks for your child’s Social Security number, find out if disclosing it is absolutely necessary. Plus, ask how they plan to use and protect the number. If you’re not satisfied with the answers, don’t share the number! Tip #5: Request free credit reports for your child. If an identity thief opened fraudulent credit accounts in your child’s name, then your child will have a credit report that shows it. You can get one for free every 12 months from each of the nationwide credit bureaus at annualcreditreport.com. If you want to keep an eye on your child’s credit more frequently, you could space out your requests and get a report from a different bureau every four months instead. 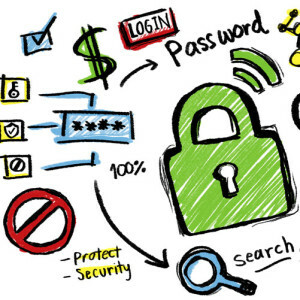 Teach kids that their name, address, email, passwords and Social Security number should never be shared over the Internet or with anyone they don’t trust. Taking precautions now to shore up your defenses against identity theft can help you avoid the hassle and expense of restoring a child’s identity later on.